Sounds perhaps not your average flavour for an ice cream especially when teamed with cinnamon biscuits and bean paste. However it is standard flavouring for all sorts of things in Japan such as green tea Kit Kat biscuits. Can you imagine? Mind you they also have strawberry flavour kit kats too. Clive succumbed in Kyoto and it was lovely (once we got the words 'bean paste' out of our minds). As this fall in the remit of Jemma's may challenge I have entered it. Looks lovely, even though it doesn't sound it! Gorgeous LO - very striking colour combo! What a brilliant page! Those 'off the page' bits are seriously clever ... and matting the photos with black really underscores the Japanese flavour. 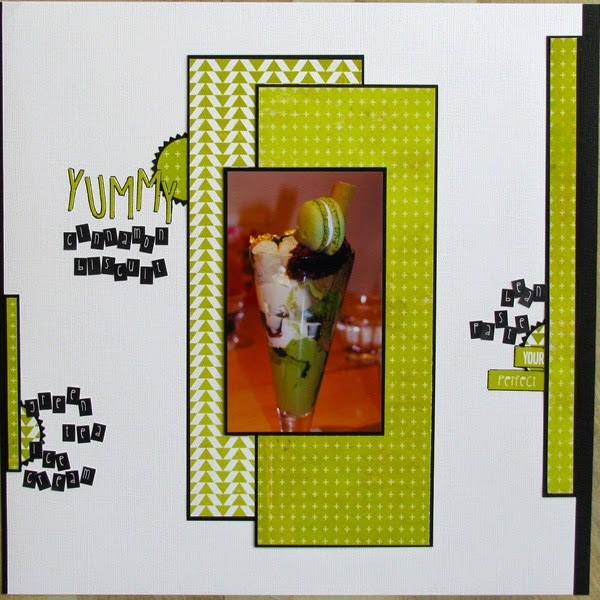 Oh love this LO... those colours are fabby indeedy and the icecream looks seriously beautiful! WOW - fabulous page - so crisp and stylish! I want to dive in and try some! Fantastic page! I love lime,black and white! P.S. You need to link up to my post on the CKCB (not Mr Linky) to be in with a chance of the prize!